We are thrilled to introduce MCYO’s Chamber Music Program! After a successful first season of Chamber Music, MCYO is thrilled to open registration for its Chamber Music Program 2018-2019. During its first season, 15 groups had the opportunity to work with outstanding faculty and perform in concerts, competitions, and masterclasses. MCYO will continue to provide quality and structured Chamber Music to its talented young musicians this coming season. 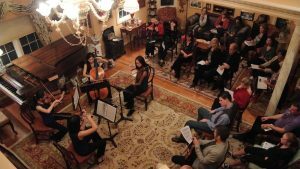 The Chamber Music Program offers talented young musicians the opportunity to closely work in small ensembles (trios, quartets, quintets, etc) with exceptional faculty, perform in master classes, and participate in chamber music concerts and competitions. In addition, groups are invited to perform in Strathmore events, National Philharmonic & BSO concerts, Strathmore partner collaborations, and other community events. Eligibility: the chamber music program is open to students 5th-12th grade enrolled in MCYO orchestras and not enrolled in MCYO orchestras. (MCYO students will have priority when forming groups). This program is open to string, woodwind, brass players, and piano students. WHEN and WHERE: the program meets on Tuesdays at location TBD. COACHING SCHEDULE: the program is structured in 2 semesters (Fall and Spring) of 10 classes each, culminating in a Chamber Music concert/recital. Two sessions will run on Tuesdays: 6:30PM and 8:00PM. Parents will be able to select a preferred time during registration. TUITION: Program tuition is set at $325 per student for each semester for members enrolled in MCYO orchestras. Tuition is set at $425 for musicians not enrolled in MCYO orchestras. Families will have the flexibility to do a payment plan. Need-based scholarships will be available. Contact MCYO’s Executive Director, Cheryl Jukes at CJukes@strathmore.org, for information on financial aid. FORMING GROUPS: Student age/grade/playing level, video submission, and MCYO auditions will guide us in forming the chamber music groups (trios, quartets, quintets, etc.). AUDITION: Video Submission is REQUIRED for students who are NEW to MCYO and for students who are NOT re-auditioning for MCYO in August 2018. (No professional recording is needed). Video Submission in OPTIONAL for returning MCYO student who are auditioning in August 2018. Videos should be submitted by Monday August 20, 2018. For late applications please send an e-mail to mmontano@strathmore.org. • QUESTIONS? E-mail MCYO’s Director of Programs, Dr. Maria Montano, at mmontano@strathmore.org!